Emily Maxwell is meeting her family for one final summer at the house on the lake. After the death of her husband, she plans to sell the summer home that holds so many decades of memories. Emily makes the trip with her sister-in-law as each remembers the man who meant so much to them. They are joined by Emily's son Ken, who is trying to decide if his love for photography is enough to justify his decision to quite his job. Ken bring his wife Lise and two children. Last to the party is Meg, who was always Emily's problem child. She hopes this trip will help her move on from the end of her marriage and connect to her children, who seem increasingly distant. One week at the lake house with the Maxwell family is a revelation about the ways in which our families members disappoint each other and the bonds that cannot be broken. 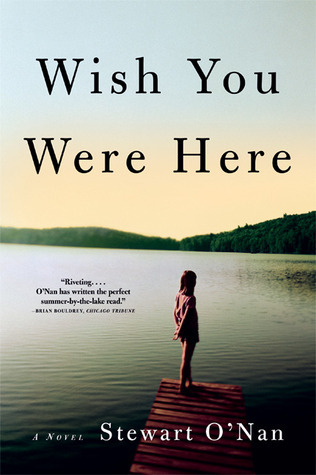 I read Wish You Were Here primarily because I heard rave reviews about its sequel Emily, Alone. It felt wrong to read that book without reading the first book. This was an excellent choice. Wish You Were Here is a great book. It is one of those rare stories that seems to be about the minutiae of life, but it is ultimately about the ways in which our families shape us. This novel had so much in common with The Red House, a book I read earlier this year. But this one was superior in every way. Wish You Were Here is devastatingly real. This is a family mourning the loss of a husband, a father, a brother. It's about appreciating the people you love and the time you had with them, but not until it's too late. It explores a mother's disappointment that her children did not become all she dreamed that they could be and the children's knowledge that their mother feels that way. It delves into the competition between a sister and a wife and how both can feel that one man belongs to them because he did...but for different times in his life. The insights into family dynamics that O'Nan makes between the covers of this book are stunning. Mr. O'Nan is one of those wonderful authors who can inhabit the mind of anyone - an elderly woman who doesn't know how to hold her tongue, a grown son trying to balance his passion for photography and the need to support his family, and a teenage girl who feels like the ugly duckling in the shadow of her beautiful older cousin. The movement between the characters is effortless and it is just as heart wrenching to live in the mind and heart of Meg as she tries to pick up the pieces of her broken family as it is to witness Emily wonder how she will be remembered. "That way of life seemed unthinkable now, antique, and yet it had been hers, was still the guide and yardstick she relied on. She wondered if the children would remember her the same way, these strange corn cakes hopelessly old fashioned. Of course. She would be their past. Time was not a circle or a line but a kitchen, a lamp, an armchair." Wish You Were Here is a gorgeous novel. The characters are intricate, and their relationships will make you smile in recognition and consider your own family. This is the perfect read for a lazy summer day or an endless winter evening. If tales of the connections and complications of family are your kind of reading, this is a book you don't want to miss. I love these books about real, everyday life but they are so hard to get right. Sounds like the author has really managed it here though! I was hesitant, but I'm so glad that I read this one. I'm really looking forward to the sequel. I have NEVER read Stewart O'Nan which is a crime, I'm almost certain. Great review of this one. I usually don't go for family stories (does that make sense), but it sounds like this one is exceedingly well written which gets me every time. I understand completely. I don't read a lot of family stories myself, but this one was excellent.